Spin Flash Dryer is a vertical dryer with a rotary shredding device. It can dry, crush and classify materials at the same time. It is continuous drying equipment, specially designed for drying cake-like, pasty and slime-like materials. The clean heat medium heated by the heat source enters the drying chamber in a tangential form, its forms a powerful swirling flow with the mechanical stirring mechanism. The wet material is feted into the drying chamber quantitatively by the screw feeder, and is crushed and dried under the action of agitation and vortex airflow. The top of the drying chamber is provided with a particle size classifier. 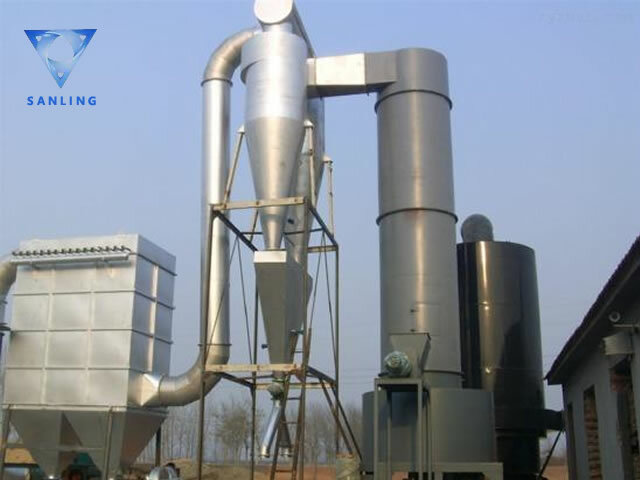 The fine powder meeting the requirements is discharged from the top of the column and collected by the back separator. The larger particles which are not meeting the requirements are blocked by the classifying ring and returned to the drying chamber. until these power meet the requirement, It will be discharged with the hot air from the drying chamber, collected by the separator. Clean exhaust released to the air by exhaust fan. Negative pressure or micro-negative pressure operation, good airtight, high efficiency, and no environmental pollution. 4.Food: soy protein, gelatinized starch, wine tank, wheat sugar, wheat starch.